Every new client needs slightly tweaked copies of documents you’ve sent before. You could make new ones every time, but that takes up so much time. Copy old documents, though, and you run the risk of forgetting to remove a former client’s details or to include crucial terms of service or non-disclosure agreements. Your time would be much better spent on your projects and clients. You need something that will help you put your best foot forward every time you start working with someone new, something that will help you land more projects with less work. You need a proposal app. Here’s why—and the best templates you could use to streamline your proposal process. Clean creative minimalism and sharpness dominate the impression one gets when reading through this amazing project proposal template. Good for professional-looking business proposals that’ll help get you more new clients, it features well-organized content presentation for easy readability. 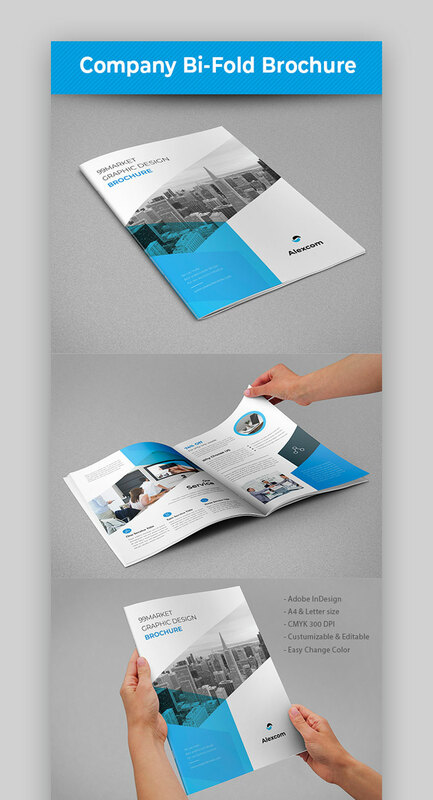 A multipurpose portrait format creative business proposal or brochure. It has 30 pages A4 and US letter sizes with strong typography. It has creative proposal layouts that you can customize quickly. Just drop in your own images and texts, and it’s ready. Free font called Roboto and icons were used. This minimal and simple business proposal format template is suitable for all business types and professional proposal needs. It’s created in Adobe InDesign and comes with 20 pages, two paper sizes including US Letter and International A4. It uses elegant and free fonts, Raleway and Sora Regular were used. Additional invoice and contract template are also used to give a very nice standardized look to your business. 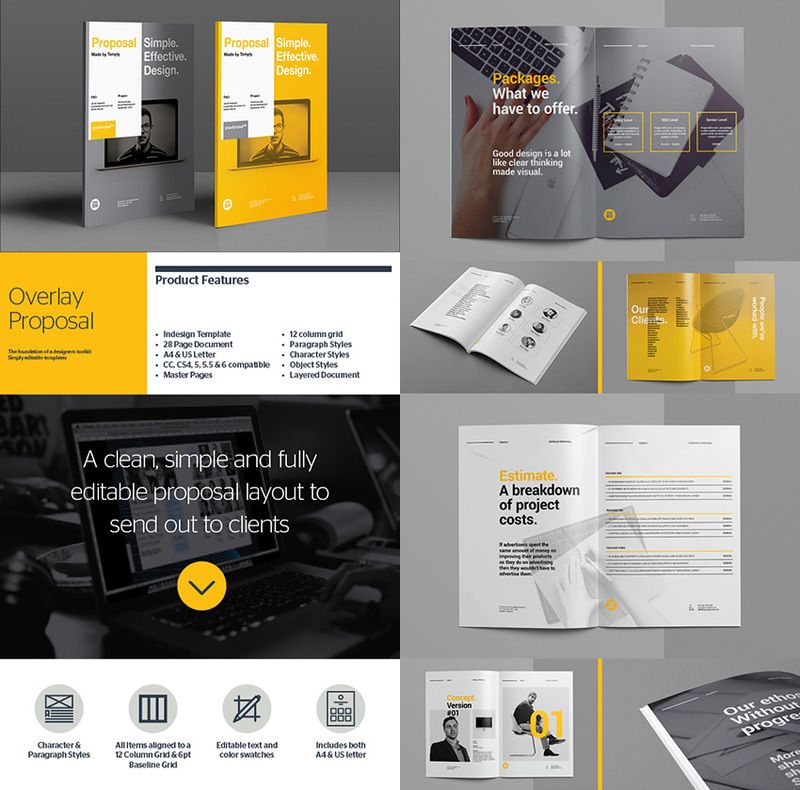 CorpoBiz is a great creative business proposal template. It’s perfectly designed for: annual reports, company profiles, project proposals, offers, presentations. It’s made for architectural studio, creative agency, technology presentations and many more to put to use. This is a fully editable template that allows you to use different fonts, colors and backgrounds to design great business proposal cover pages and interior pages fast. 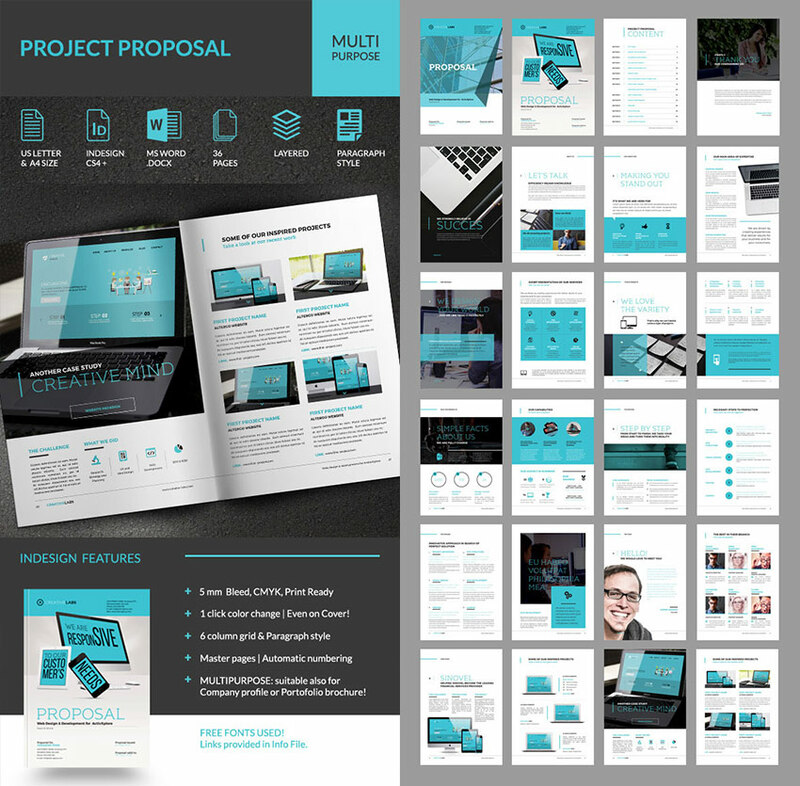 Put your photos in this set of proposal layout designs and promote your business. It’s that quick and easy! An ideal 40-page complete project proposal template. Even change the background color according to your needs, with its easy customization and editable creative proposal layout features. Paragraph style, and character styles included. 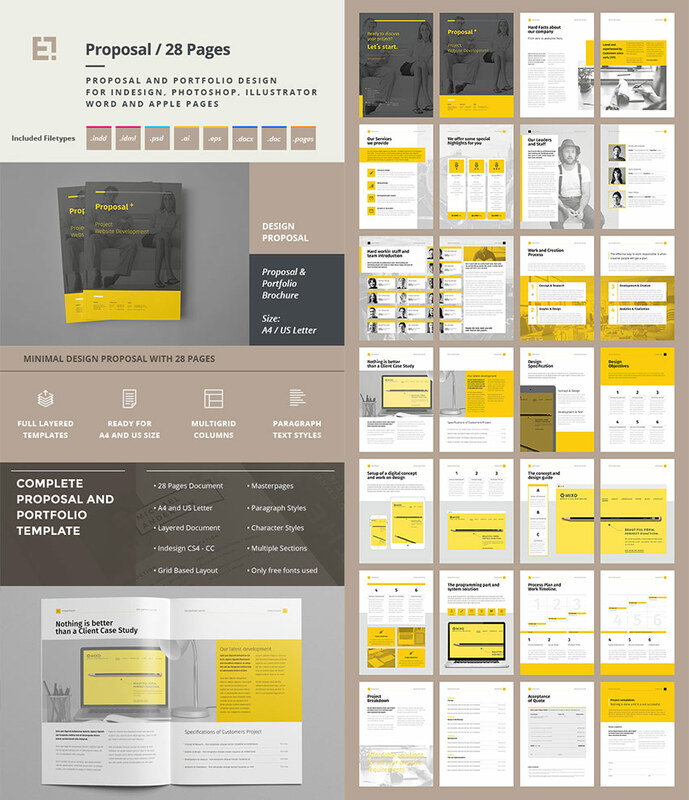 This is one of the best InDesign proposal templates. It comes in both A4 and Letter size. 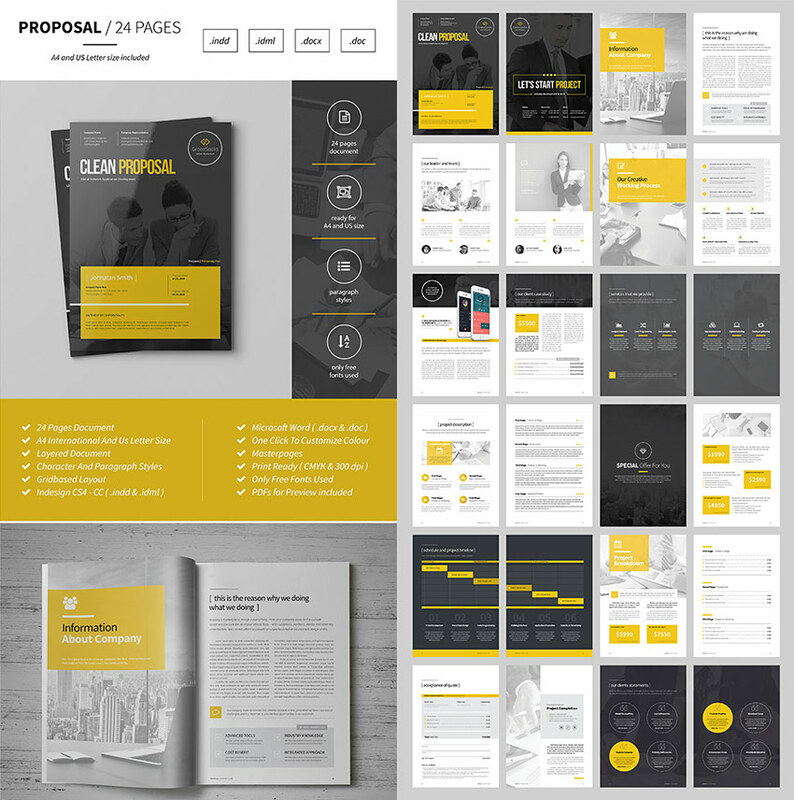 Legowo Business Proposal is a simple and clean 18 pages template that looks great in black and white. Its creative design is organized with layers and text that are fully editable. From proposal cover page design, to portfolio page styles, and numerous inner page layouts, this proposal has you covered. 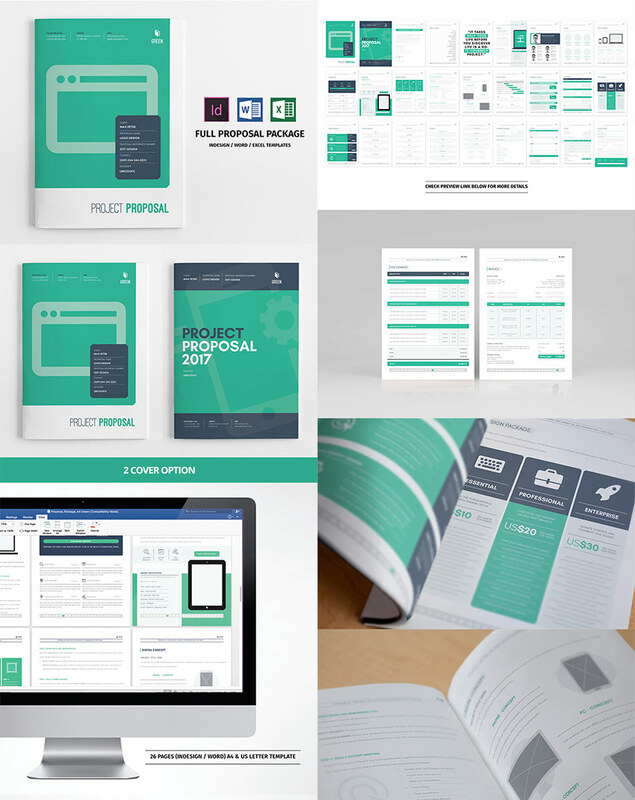 Perfect if you’re looking for a multipurpose proposal template that’s modern and professional. Go landscape and stand out from the rest by leaving a lasting first impression. 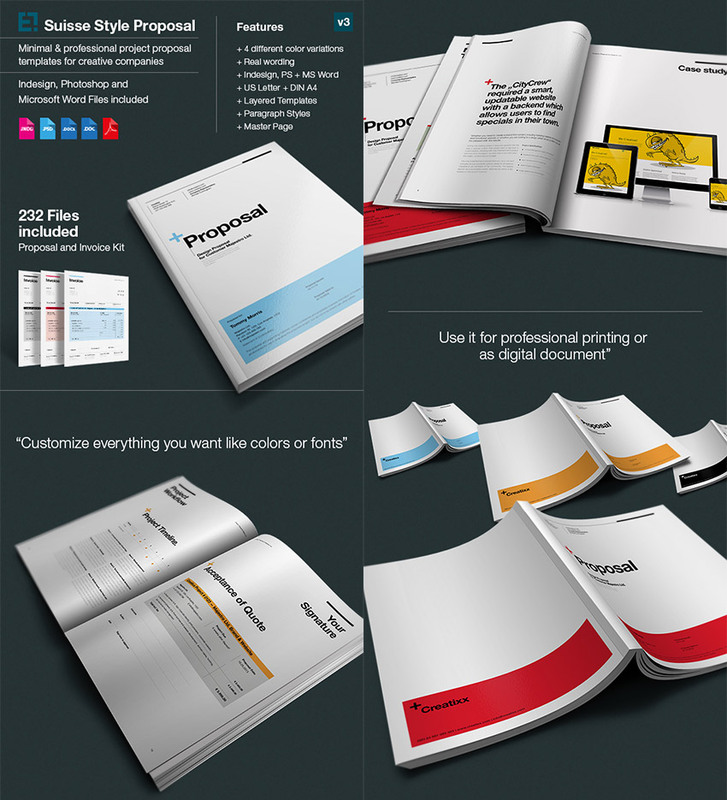 This is a 28 paged professional fully-editable InDesign proposal template file with well-organized layers. 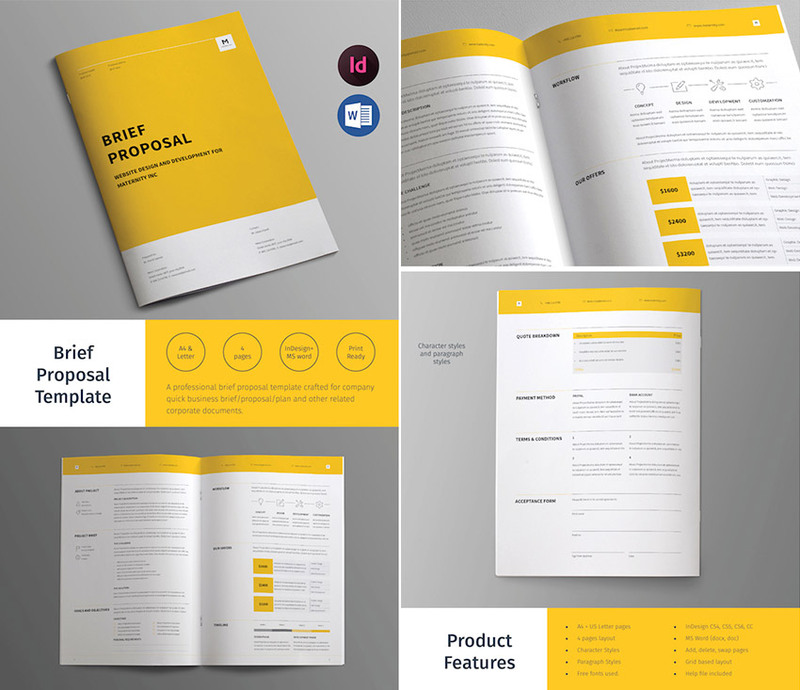 Use this creative proposal design template to get your next project proposal created quickly with a beautiful booklet style layout. A brochure is a perfect deliverable when you’re giving a business proposal. It gives visitors and potential investors a “take home” document that they can review and read long after your big day is over. With 40 different layouts, there’s no shortage of design concepts that you can draw from in one convenient package. This InDesign template has well-defined columns and structure that makes it easy to add your content. With this package, you’ll build out your company proposal in less time than you ever thought possible. An annual report is one of those critical documents that companies issue year after year. It helps recap the year that was just completed and chart the course for the year ahead. But as you can see in this template, an annual is more than just data tables and statistics. It’s a narrative about the company because it leaves plenty of room for storytelling. This template is the perfect way to blend your results and data with a well-articulated narrative about where your company is going. Here’s another outstanding brochure choice that can give your audience something to remember. Available for Adobe InDesign, this print-ready A4 / letter sized template has two different color schemes for a sense of variety. The simple bi-fold design helps you focus on the most important data about your company. Fill it with the key facts and figures that’ll have the audience ready to join your team or offer investment. This creative business proposal design template is just what you need when you’re trying to land new client projects. It’s a top-selling template that’ll come in handy for the ambitious entrepreneur who is trying to land their dream client or big project. Full of neat organization and an easy-to-read column layout, this template will ensure that your proposal’s selling points jump right out at your clients when they look at it. It features 12 pages, is print-ready, comes with InDesign INDD graphic files, six predefined color themes, and free fonts. Proposal templates like this smart choice can increase your chances of working with that dream client that you always wanted. Its highly professional-looking and sleek presentation will command your prospects’ attention and give your proposal the time and respect that it deserves. This 16-page template features four unique color variations along with Microsoft Word, Photoshop and InDesign files all part of the package. With its generous use of white space and minimalist approach to text formatting layouts, the Suisse Style Proposal is sure to make your business proposal come across favorably. 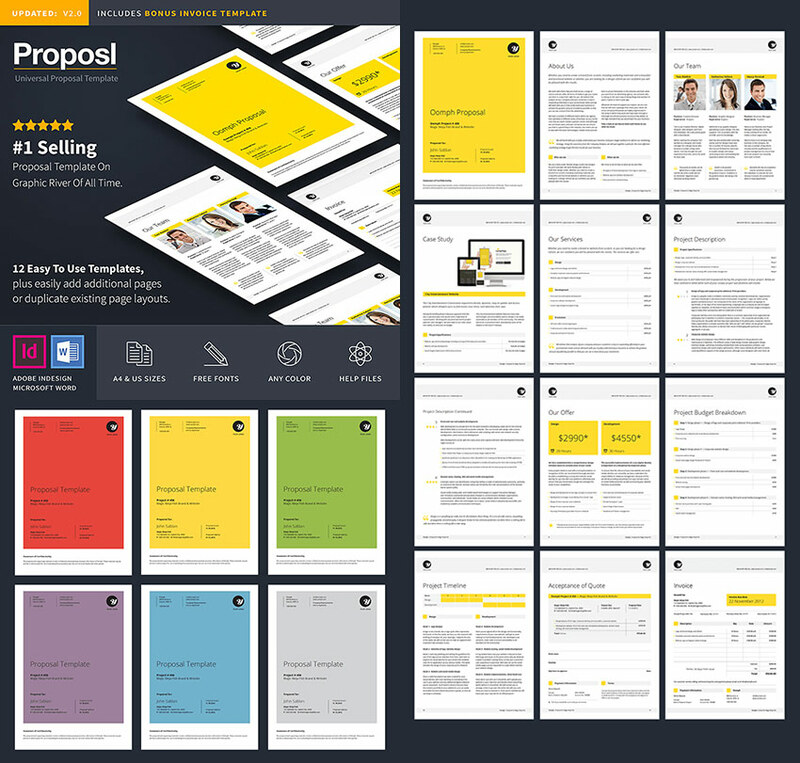 Good for creative businesses like solopreneurs and freelancers, this awesome proposal template was created in Apple Pages, Microsoft Word and Adobe InDesign. Available in both Letter and A4 sizes, this proposal features customizable fonts and colors, so that you can improve it to exactly match your brand’s personality and style language. It’s a fully layered template, that contains multi-grid columns for easy reading and a clean design. There are plenty of page styles to work with, form engaging proposal cover page designs to a diverse mix of internal layouts. Copy is arranged in legible paragraph styles for maximum reading retention. An ideal graphic design business proposal template for small business owners and creative entrepreneurs always looking to expand their client base. It’s sharp, well-designed, and is packed with a number of components that’ll help your proposal persuade professionally. Featuring 36 pages overall and 8.5 by 11-inch print dimensions, this template will grab the attention of leads, prospects and future business collaborators with its stylish and vibrant content layout and presentation. This is a must for any serious entrepreneur. It comes with InDesign INDD graphic files and was designed for Microsoft Word and Adobe InDesign. The Business Plan Proposal InDesign template gives any proposal you present to new clients the immediate credibility of professionalism. 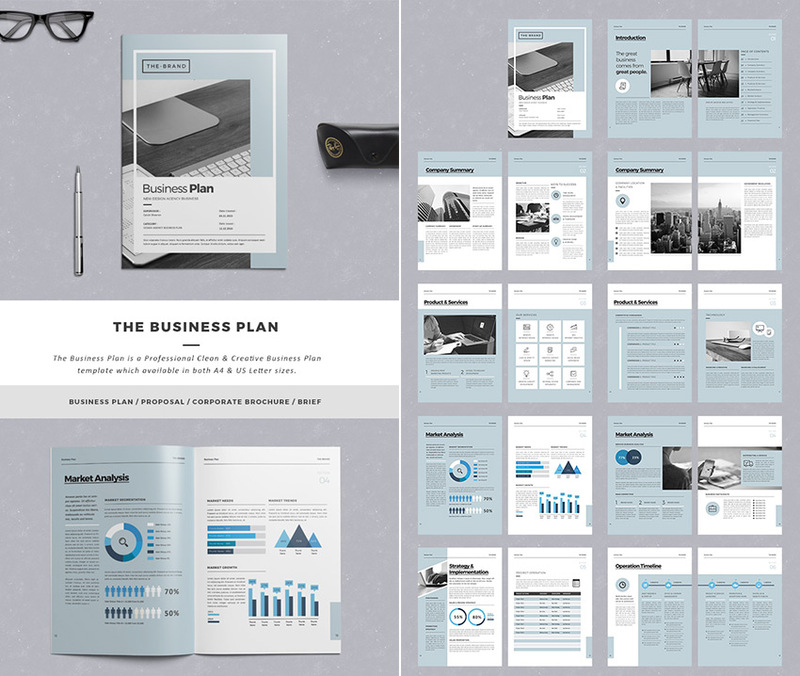 A modern, clean and creative business proposal template, it comes in both A4 and US Letter sizes, features 24 custom pages in all (with great interior and proposal cover page designs), and shows readers a six-column grid layout that makes for easy reading and retention. You can rest assured that you’re always going to be in control of your brand identity, as this template is completely customizable in both text and colors. Freely use this template for any industry proposal. As far as proposal templates go, multi-page proposal set is one that makes any attempt to secure a lead more efficient than ever. With its clean and smartly designed layout, it helps your clients to focus their eyes on the important details of your proposal, allowing your most salient points to be in the front of their minds. Featuring vibrant splashes of color for effective contrast, this template is a winner no matter what the emphasis of your proposal. It’s fully editable in Microsoft Word, Adobe InDesign and Illustrator. This stellar business proposal template example is very refreshing since it puts the concise focus on presenting to your leads and prospective clients. 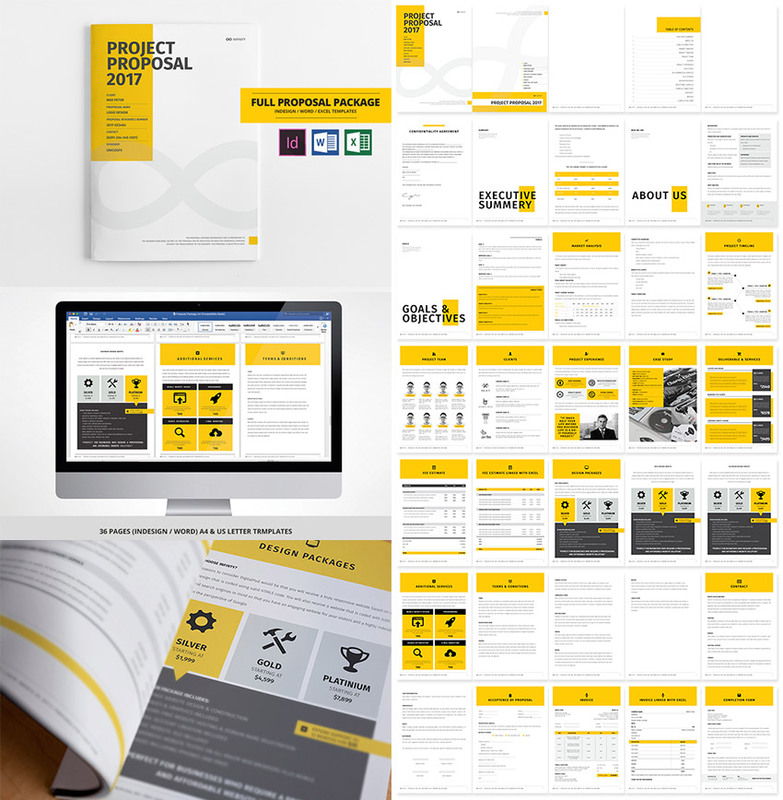 Whereas many other templates rely on lots of pages to help you showcase your idea’s strengths and creativity to clients, the Business Brief Proposal Template goes in completely the opposite direction. Featuring just four pages, this creative proposal design lets you focus on the most important initiatives and get right to the point quickly. Available in both A4 and US Letter sizes, this document is ideal for creative proposals related to web design, marketing, SEO and graphic design, among others. If you need a standout business proposal cover page, with a variety of creative interior page designs, then it’s time to use a professional template. With 36 pages bursting full of grids, columns, charts and table layouts, this full proposal package packs a lot of value into one template for the price. This makes it ideal for presenting longer and more detailed projects to your prospective clients, who’ll surely appreciate the extra information that you can pack into one proposal. Perfect for small business owners, entrepreneurs and freelancers alike, this business template leverages free fonts and includes InDesign INDD graphic files. This 28-page document is perfect for bringing exciting proposals to your clients for approval or collaboration. Its simple-yet-effective design means that you’ve got full control over the final proposal, thanks to the fully editable text and color swatches in the template. Its appearance is very well-organized with a 12-column grid and a six-point baseline grid. This product comes with vector infographics, master pages, character and paragraph styles, and is compatible with Adobe InDesign CS4 through CS6. Make a proposal cover page design that stands out quickly, and fill your business proposal with engaging page layouts. This useful, 24-page business document is just what small business owners need to present persuasive proposals to new clients. Its layered and grid-based layout ensures that your presentation’s most vital takeaways are easily seen and retained by your readers. 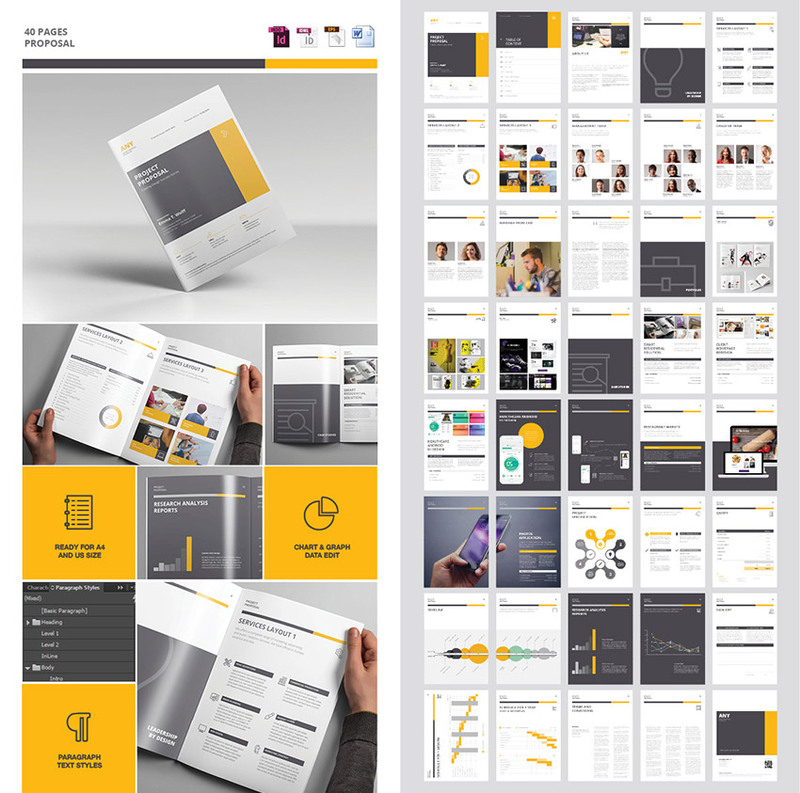 Featuring a color scheme based on contrast to highlight the most important content, this Multipurpose graphic design Business Proposal example is also compatible with Microsoft Word and Adobe InDesign. It’s print-ready and allows you to customize colors with only one click. This lovely and creative business proposal allows you to let your brand’s colors shine, thanks to its customization options. The swatch palette lets you adjust the color values to your brand’s own, which gives your business proposal format template a level of personalization that lets new clients know you’re a serious player. You can quickly customize your business proposal cover page and interior pages with unique designs. 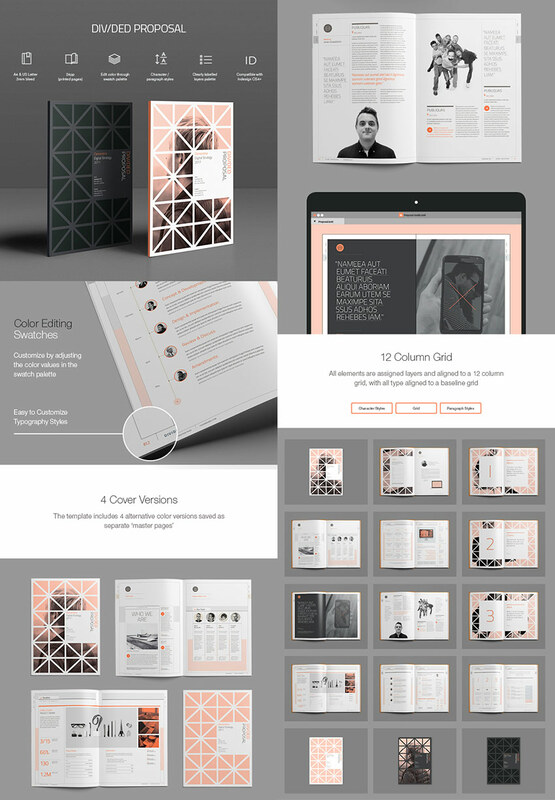 With four distinct cover color versions, this business template features InDesign INDD graphic files that drastically increase your chances of winning the job you want. It comes with a 12-column grid, US Letter and A4 sizes, and uses free fonts. This 20-page custom document features completely editable text, objects and colors, making it a very versatile template to use to land the job that you want. Impress your future clients with a well-written and well-presented business proposal example that highlights your small business’ unique selling proposition. Thanks to its grid layout, your clients can efficiently scan the relevant information that your proposal presents to them with ease. Its well-organized presentation lets you effectively chunk content to allow readers to pick out the most important info. The strength of any persuasive and memorable business proposal lies as much in its presentation as it does in its writing. This spectacular business proposal template features a clean, minimalistic and well-organized layout that empowers your readers to see and absorb the most relevant stats, facts and information in your presentation. Entrepreneurs will love the flexibility and customizability of this creative proposal design. You’ll want to use it to design for all of their new-client proposals. Make your business proposal cover page and interior pages stand out distinctly. It comes with Microsoft Word, Excel and Adobe InDesign proposal template files for amazing utility. It’s best to grab business templates that you can re-use for multiple projects. This option is a perfect example thanks to 24 different page templates. Each of them is easy to customize in Adobe InDesign, but you can choose which ones to use for each project so that you never repeat your designs. Norfolk is print-ready thanks to an A4 print size template and proper color options. Free fonts are used so that the template is the only purchase you’ll need to make to create and propose your business. 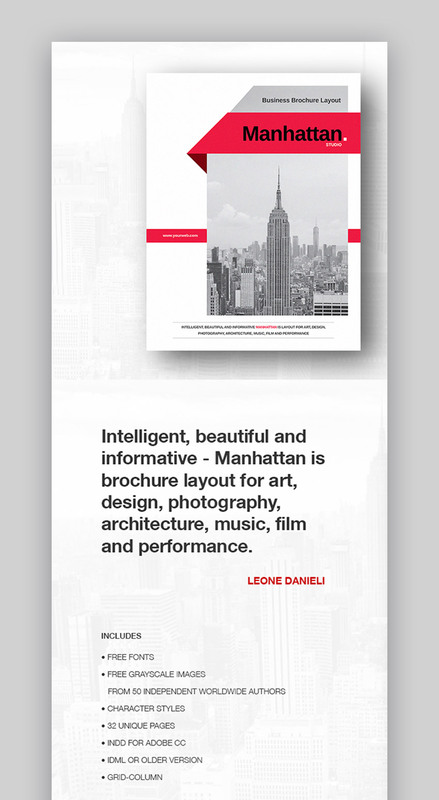 Manhattan comes from that classic “less is more” school of design where bold typography takes center stage. Thirty different templates that are easy to customize in Adobe InDesign help you create a modern, minimalist proposal. To make the most of Manhattan, add a few key brand images to the placeholders. 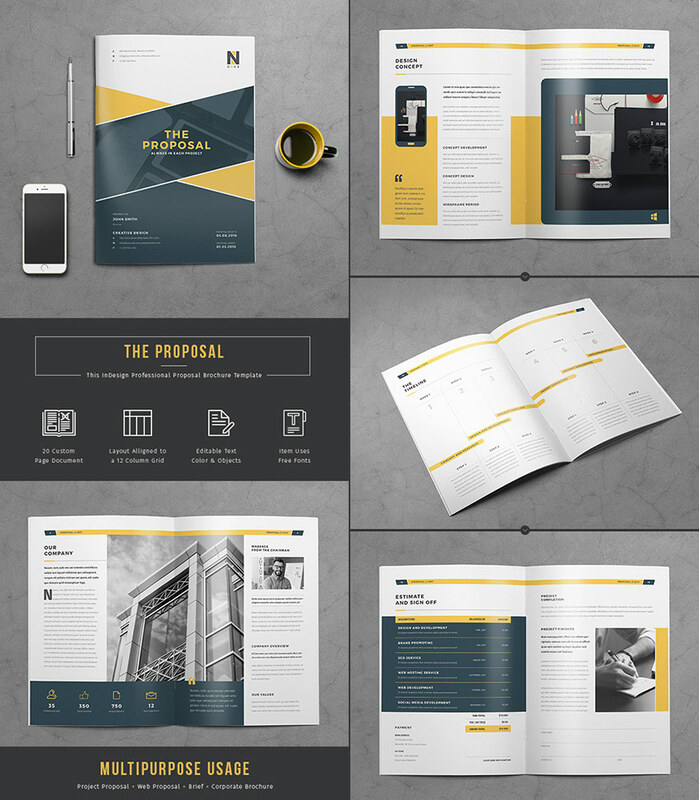 This proposal template design focuses on showcasing what your business does best in bold elements. Combine those with your signature brand color and it’s sure to catch the eye of your audience.